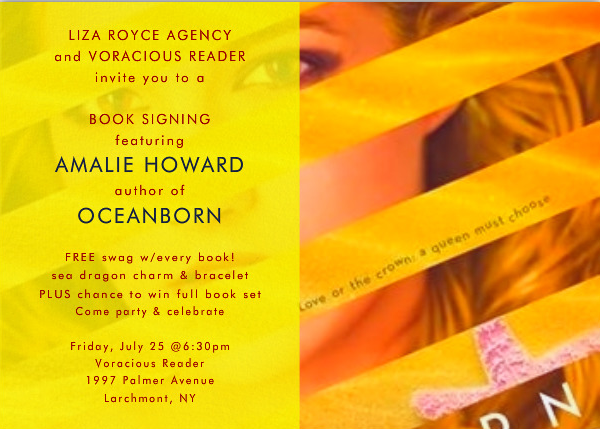 You are cordially invited to the OCEANBORN launch party at the Voracious Reader in Larchmont, Friday July 25th (FOUR days earlier than release) at 6:30pm! Special swag with each book purchase (including a sea dragon charm, tattoo, and Aquarathi wristband), raffles, M&Ms, and more! If you can’t make it, you can still get your very owned signed copy from Good Choice Reading and have it shipped directly to you! Click HERE for more info (party swag included with all purchases). Sign up to receive my latest news, events, and giveaways!